Hi reader! You seem like a cool guy. Coincidentally, I can relate exactly with what you're going through, so I'd like to share my recent experience with this same objective. 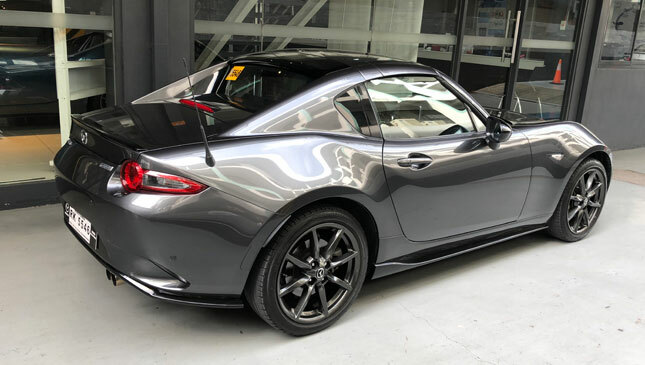 Growing up I had two dream cars in mind for when I hit my 30s: A Honda Civic Type R and a Mazda Miata. As a teenager, I thought these two models were the coolest-looking cars that were right up my style. A couple of months ago, I was fortunate enough to get a loaner 2018 Honda Civic Type R overnight. After driving the Type R one morning, I immediately realized that a stick shift is not going to work for my planned daily driver use. With the Type R out of the picture, I shifted focus to the Mazda MX-5, which thankfully had an automatic option. 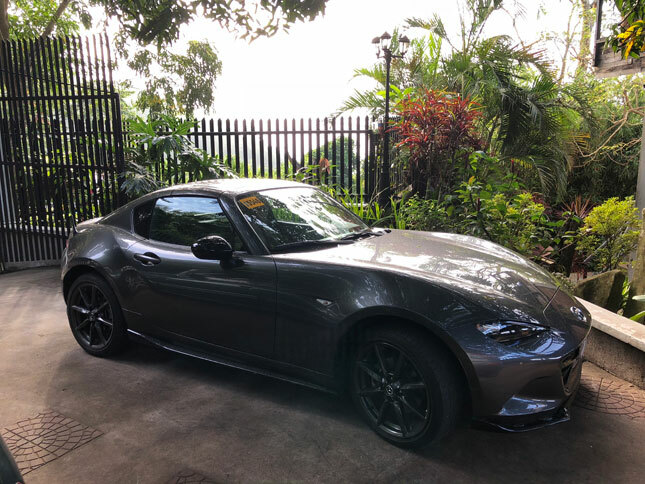 I scheduled an MX-5 test drive with Mazda Makati, and after just a few minutes of driving the car (on EDSA even), I knew that it was a fit. 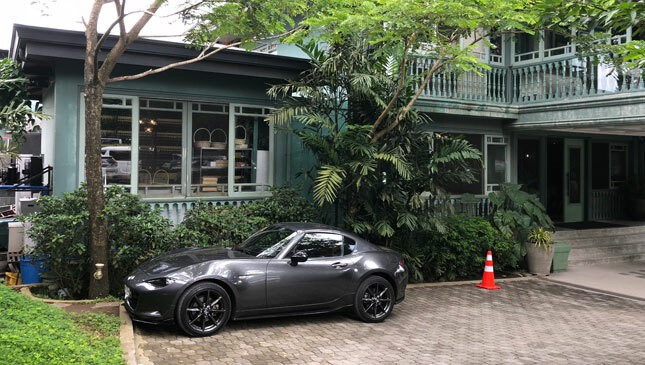 The acceleration, the handling, the overall feel and features of the MX-5 were the right balance of exciting, sporty, practical, and comfortable. Having decided that this was the car I wanted, it was now time for the more important part: Convincing the wife. This wasn't going to be an easy task. You see, my wife is not a big fan of Japanese cars. This is one of the reasons we drive a Ford. When she was still single, she drove a BMW 318i. Any marital discussion that involved Japanese cars (with me bringing up cars like the Honda Civic Type R, Toyota Fortuner, and Mitsubishi Lancer Evo) would end up with the same response from her: "I'm more into European cars". My wife is also very practical, so getting her to agree to the idea of a small, two-seater Japanese convertible as our second daily driver was going to be an almost impossible challenge. 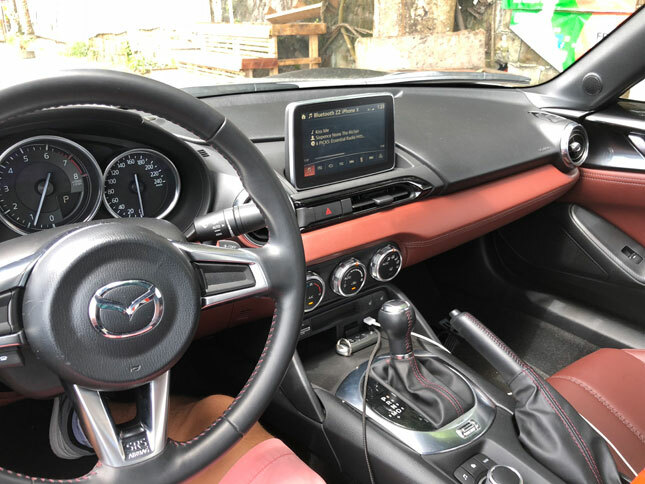 Through friends in Mazda Philippines, I was able to schedule a weekend loaner unit. 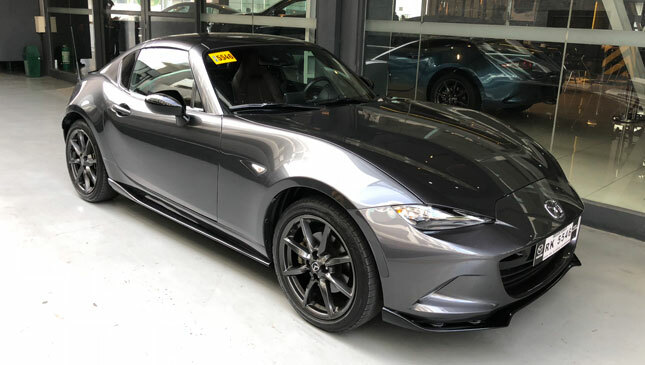 It was a 2017 Mazda MX-5 RF (retractable fastback) with a Machine Gray exterior and nappa leather interiors. I took my electric kick scooter to Mazda again to pick up the car. This car was just beautiful inside and out. After taking photos and posting IG stories, I proceeded to Bonifacio Global City to pick up the wife from her office. "OMG it's so small!" was her first reaction. On the drive home, she was laughing the whole time at how low we were on the ground and how tight the whole car felt (compared to our massive Ford Explorer). The next day, my wife drove the MX-5 to work. This was the first real test I thought. As soon as she got to the office, she called and gave me immediate feedback: "the knobs and buttons for controls are very manual", "why can't I push a button to automatically adjust the seat? ", "why are the power windows not automatic when I press it?" 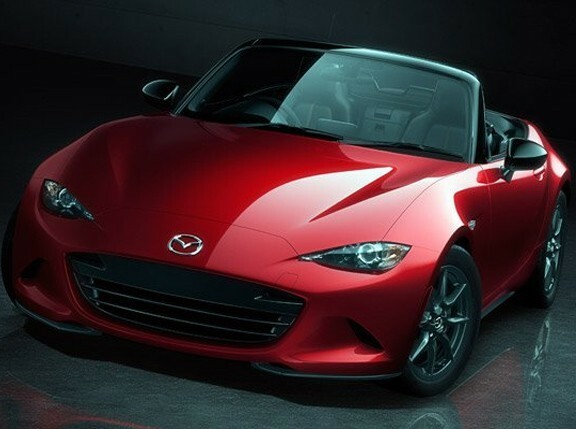 Except for the last one which I agree should be improved in future revisions of the Miata, I tried to explain that part of the essence and character of an MX-5 is that with all the technology in it, it still has very 'old school' feel, and that the car is not meant to be like a Tesla. "Yeah, I think I'm more of a Tesla-person," was her response. 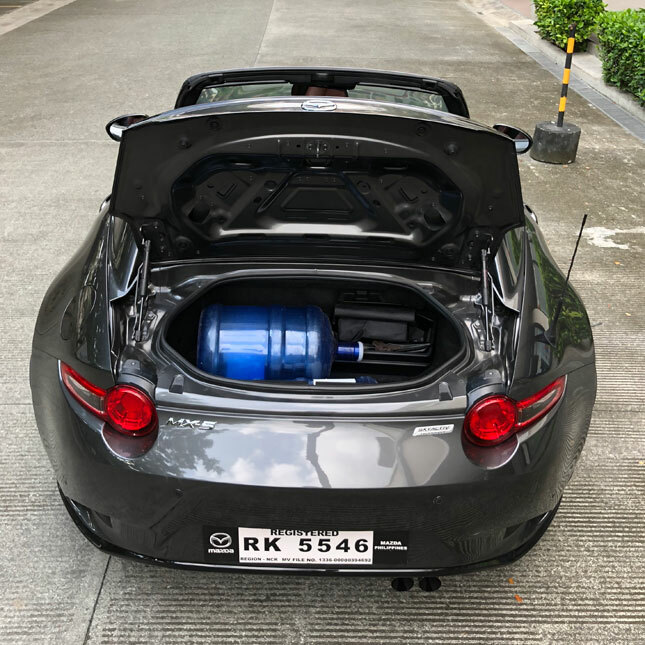 On her drive home from work, she brought along her officemate (who was into cars), and they drove around BGC with the retractable fastback roof down. 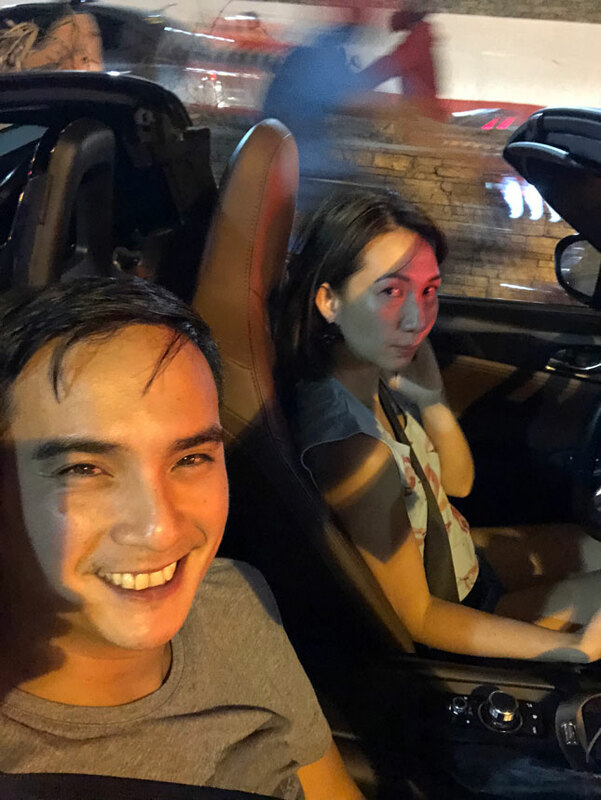 With the music turned up and their windows down, the two of them laughed at how silly it was to be in such a small car driving beside the large BGC buses. When they got to the house, they were both smiling. "It has begun", I silently told myself. 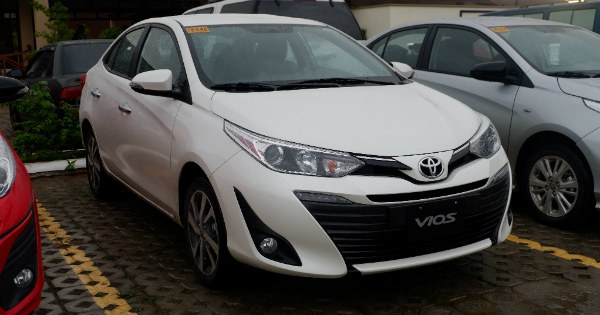 To really enable her to appreciate and enjoy this car, I booked us an overnight stay in Casa Alegria, a nice cozy bed and breakfast in Tagaytay. Before heading up on that Saturday morning, I did some minor chores first using the MX-5. I loaded three five-gallon containers of mineral water, two in the trunk and one in the front passenger seat floor, and proceeded to our neighborhood water refilling station. After chores, I loaded up our stuff for the weekend and we were off to Tagaytay. Our first stop was lunch at Balay Dako, a nice family-home-converted-into-a-restaurant place in the heart of Tagaytay. As we were looking for parking, the parking attendant surprisingly led us to a perfect slot right alongside the driveway of the restaurant. "Oh, there you go!" the wife said. It started to rain after lunch, but because we were parked near the driveway already, I just had to quickly dart to the car and back up a few meters to pick her up. "That was nice!" she added. After checking in and resting a bit in the afternoon, we got ready to head out for dinner. 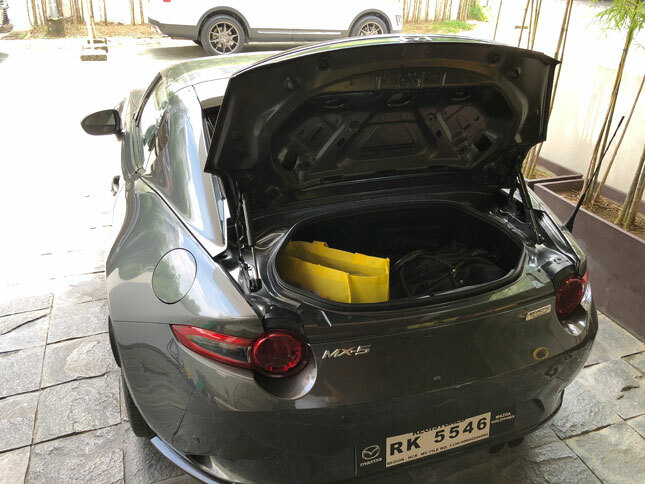 It was still raining so we couldn't put the RF roof down yet, but driving the MX-5 on Tagaytay's winding roads with minimal traffic—with the Sport mode engaged—was a thrilling experience. In this mode, the MX-5 held its gears longer, used up all the revs up to the fourth gear, and overall had a livelier throttle response. After dinner, the rain eventually stopped and this finally gave us the chance to put the RF roof down. 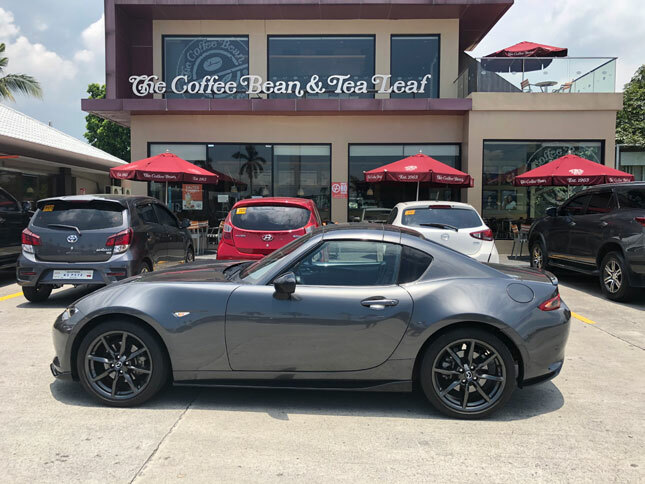 With cool Tagaytay winds blowing in our faces, '90s music pumping from the MX-5's Bose speakers, the wife and I went on a joyride like we were teenagers again. As we got back to our bed and breakfast, the wife softly uttered "I wish we had a house in Tagaytay so we could enjoy this car more". The drive home on Sunday afternoon was fast and smooth, with the wife sleeping comfortably almost the whole trip down. On Monday, she again drove the MX-5 to work. I told her I'll just get it from her office parking in the afternoon as I was scheduled to return the car that day. As I met up with her to get the car keys, she said "I'm gonna miss Mr. Miata". I maintained a poker face. 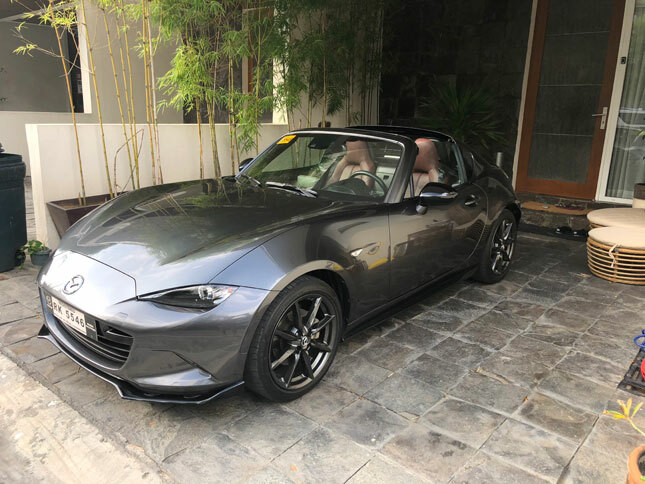 By Monday night, the wife was engrossed on her iPhone watching YouTube videos of Miata RF vs. soft-top, comparing specs, colors, and asking me what units are available brand new and in the secondhand market. We discussed the differences in price, advantages and disadvantages of each option, (e.g. pre-owned 2017 had the beige leather interior which she wanted, but only soft-tops were being sold). When I fell asleep that night, she was still on YouTube watching Mazda videos. On Tuesday afternoon she sent me a message: "I'm okay with White Pearl RF." 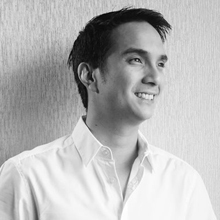 About the author: Yves was Head of Government Relations and Public Policy for Uber Philippines from 2016 until Uber’s Southeast Asia exit in 2018. He previously served as Metro Manila’s traffic director under the Metro Manila Development Authority. He has recently become an advocate for using electric kick scooters (EKS) as a personal mobility solution for Metro Manila.